NRL Tips Elimination Finals 2009 - AFL Tips Preliminary Finals 2009 - The Wallabies go for 2 in a row - Australia 6-0 up in One Dayers! - NFL into Week 2! =============================================================== Here's the man who will lead the Cats into a Grand Final against the Saints. Starting with an AFL story today and that's because the Preliminary Finals are here and in just over 24 hours we'll have our two Grand Finalists for 2009. Geelong will take on the resurgent Magpies and St.Kilda will tackle the tenacious Bulldogs. 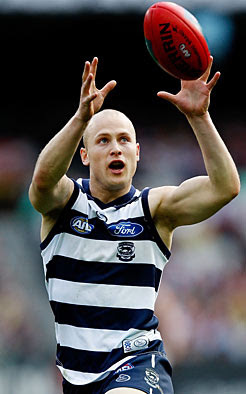 Gary Ablett Jr is the man who can shape his legacy in the game by leading the Cats to a 3rd straight Grand Final - and I'm not about to bet against him doing that. The Bulldogs-Saints game should be a cracker though - I give the Bulldogs a very good shot in it. The week that was and will be... The defending NRL Premiers Manly bowed out with a whimper (as did the Knights), the Crows choked terribly to follow suit in the AFL and the Lions were indeed just making up the numbers. Australia are now 6-0 up in the One Day Series and despite the cricket being entertaining and producing moments like Ricky Ponting's straight six over Bruce errr Ryan Long err Sidebottom - no one has really been paying attention. 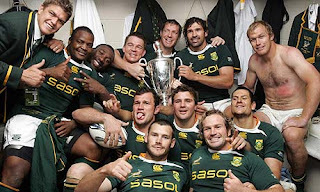 The Springboks claimed the Tri-Nations with a win over New Zealand and the NFL Season kicked off with an Overtime game won by the defending Super Bowl champion Pittsburgh Steelers over the Tennessee Titans. This is why sport is so great - this time of year. FRI: V SAT: V =========================================== Quick hit Previews for the Greatest Game of All. Click the links for Video Previews and more content on each game. Six Teams are left in the race for the 2009 NRL Premiership: =============================================== The best way to follow the 2009 Finals Series is to follow NRL_Finals_2009 on Twitter. On the first week of operation alone, we produced over 250 Tweets - with some great nuggets of information in there, as well as news as it breaks. For the Finals Games themselves, regular Tweets will be uploaded giving you an instant evaluation of how the game is being played out and what to watch out for during the match. If you don't want to miss a thing - subscribe right now or follow it on the main page of wdnicolson.blogspot.com on the right side column. =============================================== V TITANS over EELS > All Parramatta fans brimming with rage that I'd dare tip against your team - go watch the video preview and leave your rage on the page there. Don't come wagging your finger after the fact if Parra do win. Which of course they will not. Titans by 8+. Full Preview HERE. V DRAGONS over BRONCOS > Defence wins this game for mine. And the Dragons have the better of the two sides. Justin Hodges with a dodgy hamstring also confirms my St.George-Illawarra selection. Dragons by 1. Full Preview HERE. The first and second parts of our 2009 NRL Premiership Reflections Series are also available on this site and are well worth a read. 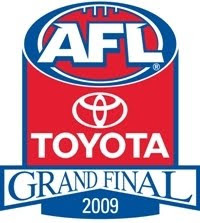 =================================================================== AFL FINALS SERIES 2009 PRELIMINARY FINAL PREVIEWS Four teams are out of the running: & & & . Four remain in the hunt: & & & The Preliminary Finals this Friday and Saturday will decide who takes the field on the last Saturday in September and battle for the 2009 AFL Premiership. Friday Night @ MCG, Melbourne #1 ST.KILDA SAINTS V #3 WESTERN BULLDOGS Skinny: I would love to see the Western Bulldogs make a Grand Final this year but I would also like to see the Saints and Cats fight it out next Saturday. Leaving me with a dilemma as to who to pick in this game. I have to take the Saints based on their season but the Dogs are a massive massive show in this. St.Kilda have had a week off to rest but given their patchy form late in the regular season - was a week off the best thing for them?. Saints by 8 points. Saturday Night @ MCG, Melbourne #2 GEELONG CATS v #4 COLLINGWOOD MAGPIES Skinny: Geelong will march into their 3rd straight Premiership Decider with a comprehensive win over Collingwood at the 'G on Saturday Night. Gary Ablett Jr, Paul Chapman and the sunscreen guzzling maestro Steven Johnson will take full advantage of the Magpies in the middle to forward third of the field and the Magpies (I sense) will run out of steam by the 3rd term. Cats to make another GF. CATS by 37 points. =================================================================== 2009 ASHES UPDATE Ryan Sidebottom playing One Day Cricket for England... thank you England selectors - always need a pick me up. That straight six by Ricky Ponting is one of my favourite shots EVER! But you have to feel a little sorry for the English selectors - the players they pick all seem to go alright but none of them really fire. That One Day team is plagued by ordinitarity (new word - don't look it up), Australia's on the other hand are getting runs a go-go from their top order and Cameron White has finally found some mojo at this level. What Peter Siddle is doing in the team however is anyone's guess... And Nathan Bracken... how about a medium pacer every so often? Follow me on Twitter during the Day's Play. ============================================================ WALLABIES TEST SERIES WINTER 2009 South Africa have the Tri-Nations Trophy safely wrapped up but Australia can make it TWO IN A ROW if they beat the All Blacks this weekend in Wellington. Yes you read right - TWO IN A ROW! 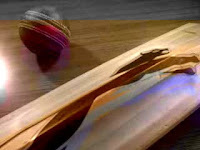 Here is the Test Schedule for Winter 2009: June 6 Sydney 7:30pm (EST) Bundaberg Rum Series v Barbarians Won 55-7 June 13 Canberra 7.30pm (EST) Bundaberg Rum Series v Italy Won 31-8 June 20 Melbourne 8.00pm (EST) Bundaberg Rum Series v Italy Won 34-12 June 27 Sydney 8.00pm (EST) Bundaberg Rum Series v France Won 22-6 July 18 Auckland 5.35pm (EST) Tri-Nations v New Zealand Lost 22-16 August 8 Cape Town 11.00pm (EST) Tri-Nations v South Africa Loss 29-17 August 22 Sydney 8.05pm (EST) Tri-Nations v New Zealand Lost 19-18 August 29 Perth 8.05pm (EST) Tri-Nations v South Africa Lost 32-25 September 5 Brisbane 8.05pm (EST) Tri-Nations v South Africa Won 21-6 September 19 Wellington 5.35pm (EST) Tri-Nations v New Zealand =================================================================== The National Football League opened with a great clash between the Pittsburgh Steelers and Tennessee Titans - with the Steelers prevailing in Overtime. Didn't catch a great deal of any of the other games bar the Patriots-Bills Monday Nighter but still tipped all but two games correctly. This will not last. A full Season Preview was added to this site recently so go check it out. And if you want to see the coolest Schedule Page in the history of sports - do yourself a favour CLICK HERE In order to stay in touch with what's happening in the NFL each week I make sure I never miss Sports Illustrated's Peter King and his legendary weekly column 'Monday Morning Quarterback' just follow the links for some outstanding analysis and reading. For the record my picks for Week Two are: Vikings, Chiefs, Cardinals, Browns, Eagles, Steelers, Texans, Bills, Redskins, Seahawks, Bengals, Ravens, Panthers, Cowboys, Patriots & Dolphins. Current Record: 14/16 @ 87.5% My Super Bowl pick is located in the Season Preview. Good luck with your tips this weekend!